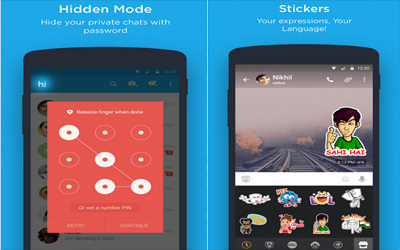 Previous version hike messenger 5.3.3 apk for Android will help you to downgrade or install older app easily. This is one of the best Communication apps. You can easily manage your message and contacts with the application setting feature. You can invite your friends in your chat groups though your friends did not use this instant message application. In otherwise, you can restrict any contact to see your chat history or other information. You can manage the contact you want to restrict from seeing your information. Instant voice message is one of features which is popular among smartphone users. There are also unique stickers that you can find in this messenger. Additional features in this application are also available. You can upload or send any kind of data whether it is written document or visual file. You can easily share photos and files to your friends easily with best connectivity on your android. The new feature that you should miss out from this application is the free voice call availability. You can also buy some stickers to be used in your private or group chat. Send your message instantly with attractive way to your friends with this messenger and enjoy sharing your moments with the best features from Hike for Android. Hike direct feature was awesome. If we able to see current online users separately it will be nice.